Here’s a list of some inexpensive and lower maintenance plants and flowers that will really add beauty to your garden. The spiraea, pictured above, is one of my favorites and will be a newcomer in my garden this year. It’s absolutely gorgeous and provides year-round interest. Incorporating all or some of these plants, flowers and trees into your landscaping could vastly improve your house “curb appeal” This could help you sell your house faster, and for more money. If you are staying in your house and just want to enjoy a beautiful garden then these 13 plants will certainly do just that. *Side Note*… If you plant fruit trees, remember to plant at least 2 so they cross pollinate and produce a bountiful crop. I would hate to see you plant just one apple tree and never get to see big, crisp apples. If you are interested in landscaping ideas too, check out my 20 Cheap and Awesome Landscaping Projects to Transform Any Garden article to get some amazing ideas. I was also excited to see some of my favorites that are already in my garden on this list, including lavender and snapdragons. 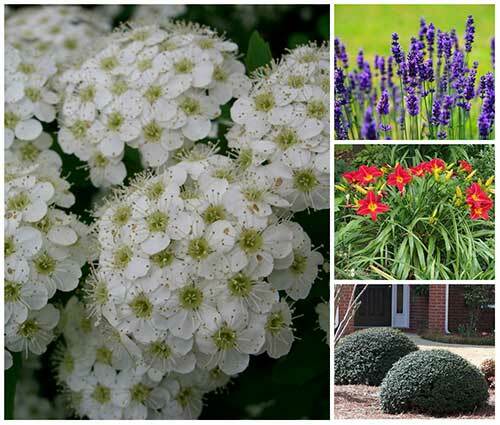 Read on to find which annuals, perennials, shrubs, and trees you should add to your landscaping to provide beauty on a budget, which is always a good thing. See the trees on page 2.